Big Coconuts Swim wear is made in the USA from the sunny beaches of Florida. These swim suits are made from the highest quality of fabric and stitching. The fabric is a Tricot® nylon/Lycra®. Tricot fabrics are the highest grade nylon/lycra with true 4-way stretch. The quality is guaranteed and the looks are as well. Our best Sunless tanner and bronzer. Keep your tan all year round. Sunless tanners are the safest way to get your tan. No bad smell that other brands have, comes with applicator mitt for perfect results and stain free palms. 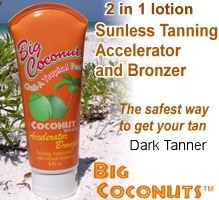 We have created the perfect Sunless tanner and Bronzer in one lotion. Copyright (C) 2000-2004 Gilmore Software/Sxeco info@sxeco.com. All rights reserved.